U.S. Youth Futsal Referee Development provides officials with the highest level opportunities for development through quality tournaments and camps, and most importantly, our close relationship with the FIFA Futsal Instructor and FIFA Futsal Referee. U.S. 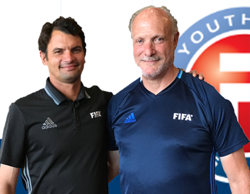 Youth Futsal works closely with the U.S. Soccer Federation and state referee organizations to ensure that all officials and assignors are certified and annually recertified. Assignors and referees must be U.S. Soccer certified to work USYF games. The U.S. Youth Futsal Regional Championships, National Championships, Regional I.D. Camps and National I.D. Camp are designated as excellent opportunities for referee development. The Northeast Regional Futsal Championships in Boston and the U.S. Youth Futsal National Championships and National I.D. Camp in Kansas City annually include the presence of FIFA Futsal Instructor Ed Marco of U.S. Soccer and FIFA Futsal Referee Shane Butler. For these three events, referees must apply online and must be selected by the Referee Committee, which is led by Mr. Marco. The USYF Referee Program offers individual league training to leagues and support training to all states. Top US Soccer and FIFA officials are in place to fulfil the needs that may arise over the course of the pre-season, playing season, and offseason. USYF can also cover Spanish language needs for Referee training. All instructors/ trainers will be assigned by the USYF Coordinator of Referees. Instructional content will be US Soccer training materials and focus areas selected for the current seasons by USYF Referee committee members. Custom content can be designed on request for individual leagues and Futsal organizations. Training clinics and Referee courses will include travel days and instructional days for all instructors assigned. Every effort will be made to reasonably limit costs. In addition, USYF feels strongly that working with US Soccer and each state association to be an important ingredient regarding building and growing Futsal in each specific area. USYF Referee Coordinator will gladly assist in contacting and coordinating with each state association Referee Committee to ensure that each course meets or exceeds US Soccer certification, re-certification, and training requirements. The cost for training events and sessions will be based on a per diem rate that includes travel days associated with the event or session and may include or be replaced by a per attendee rate for instructional days. To see what works best for your needs please contact the USYF Coordinator of Referees to discuss the best approach. Entry level course- Within the guidelines set by each state Referee Committee, each league may host an entry level Futsal Referee Course. The requirement documents must be submitted within each host state, the USYF Coordinator of Referees will assist as needed to ensure all is completed as required. The entry course typically runs through one day and includes classroom, field sessions where available, testing as required, and additional support. At the end of each entry level course each attendee should be able to register with US Soccer as a new grade 8 Futsal Referee if successfully completed and should be able to work Futsal games right after. Recertification clinic- Within the guidelines of US Soccer and each host state Referee Committee, the recertification clinic is intended to bring all Futsal Referees up to current standards of the FIFA Futsal Laws of the Game, it’s directives, current Refereeing practices, and any local modifications allowed under the Laws of the Game. Each Referee who attends and successfully completes the clinic should be able to re-register under US Soccer as a Futsal Referee. The day or days should include classroom instruction, field practical, testing – both written and physical, and video analysis and or game assessment feedback. US Soccer upgrade course- US Soccer now has 3 grades of Futsal Referees. The entry level or grade 8, the state level or grade 6, and the National level or grade 3. The entry level training path is described above. The state level should include the state level, grade 6 course work and upgrade requirements as set forth by US Soccer. This will include field assessments on U16 or above, written testing on the Laws of the Game, and fitness testing. Certain other upgrade requirements such as game count and recommendations may be outside of USYF authority but the USYF Referee Coordinator will assist in completing the upgrade process. The day required for this level course work is minimum one day, two days are recommended if connected with tournament event or other game day events. Pre-season training clinics- Pre-season clinics are an important area of training. To improve the quality of officials working USYF leagues and events ensuring that they are properly prepared and ready for what is to come is needed to grow leagues and make them competitive with other Futsal being offered elsewhere. USYF is the only Futsal organization offering such support and each league and event should take advantage of the USYF Referee Program by planning pre-season clinics for all officials. These clinics can typically be from 4 hour sessions to full day classroom and field practical sessions (recommended). These clinics are good for player ID camps, Regional competitions, special playing events, and tournaments. Details can be discussed and designed with the USYF Referee Coordinator. Costs- There are always costs in running and offering training. USYF will work to provide the best training at the most reasonable cost. Costs to travel Futsal Referee Instructors/ trainers will include travel days and instructional days on a per diem rate. The per diem rate can be replaced by a per attendee rate where each attendee can pay for the assigned Instructor directly in a way to help cut league costs and expenses. Costs will also include any travel expenses associated such as car, airfare, hotel and meals. Each Instructor has been directed to keep these cost at a minimum. In the past years, those who have used the USYF Referee Program to train their officials have commented on what a good value for the cost each has received. The USYF Referee Coordinator will work with each league or organization to develop and price each need.